Lee Plendl with his grandson, Eric Plendl, Maurice, Iowa. 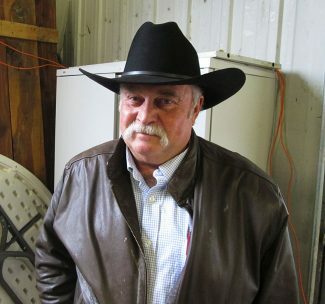 They have been buying Pieper bulls for 18 years. Cory Everett from Wagonhound Ranch, Douglas, Wyoming, took home 13 of these bulls. Longtime customer, Kevin Hodson, Martin, South Dakota, bought five bulls. Pieper Red Angus hosted another big crowd for their annual spring Performance Leader Production Sale. Even though the weather was cool, this crowd was very enthusiastic about the future of Red Angus cattle. Mark and Deb Pieper, along with their son, Tate, have built a breeding herd of Red Angus cattle that just won't take the back seat. These bulls had drawn a lot of pre-sale attention. The cattle have a tremendous amount of eye appeal with a lot of natural thickness and muscle bred in. 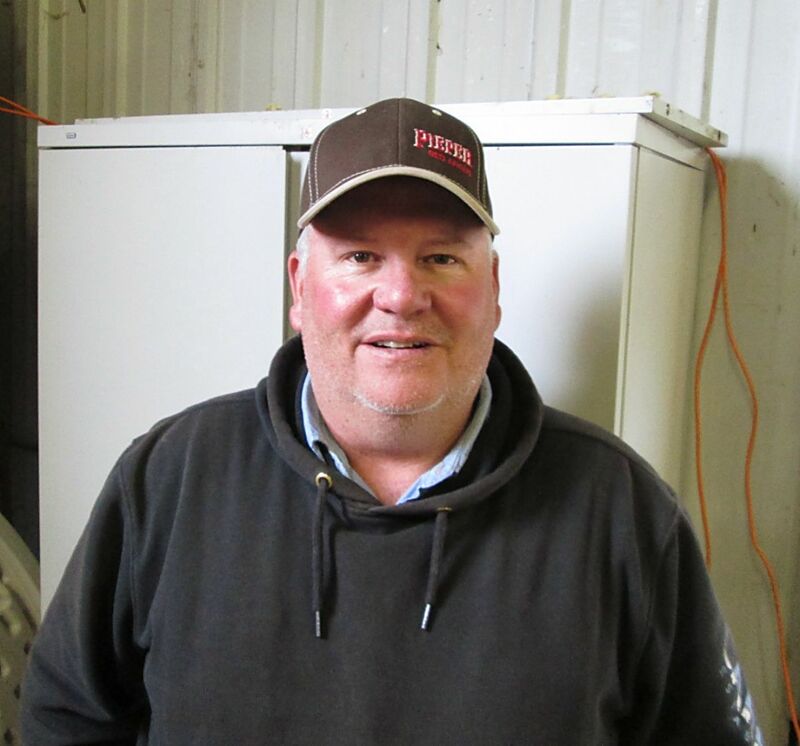 Mark Pieper stays involved with his customers through the year, with many extra services, including his purchase of many of his customers' calves. The Piepers can see the extra performance that these bulls sire. Their catalog is packed full of data on each bull. The front pen of this year's bull sale contained many potential herd sires, and this was reflected in the sale. The sale stayed very strong all day, and every bull found a new home. There was tremendous demand on all of the females, both the registered and the commercial. Top selling bull of the day was Lot 9, selling for $62,500 to Ronnie Robinson and Darrel Howard from Orlando, Oklahoma. He was PIE Cowboy Kind 690, a son of PIE The Cowboy Kind 343, and out of a Hoss daughter. Born at 82 pounds, he weaned at 705 pounds, and posted a yearling weight of 1397 pounds. His 16.2 square inch rib eye was complemented by EDPs of BW 1.3, WW 68, YW 107, MILK 19, and STAY 13. Mark DeBruycker of DeBruycker Charolais, Dutton, Montana, chose Lot 3 at $28,000. He was PIE Outside 680, sired by WCR Outfitter 4245B, and out of a Hoss daughter. His EPDs were CED 4, BW 0.1, WW 73, YW 110, MILK 19, STAY 9, MARB 0.49, and RE 0.14. Hitting the ground at 89 pounds, he weaned at 735 pounds to ratio 111, and grew to a yearling weight of 1401 pounds to ratio 111, gaining 4.66 pounds per day. 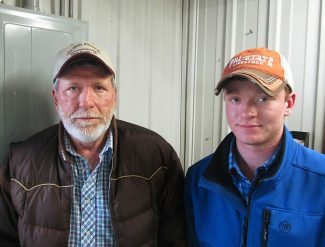 Repeat buyer Glen Gaikowski of Sandy Willow Red Angus, Waubay, South Dakota, bought Lot 1 at $23,000. PIE Right Now 695 was a son of PIE The Cowboy Kind, and out of a Laramie daughter. He had EPDs of BW 1.0, WW 78, YW 126, and MILK 18. With a final nod at $20,000, Lot 2 was purchased by Terry Crawford of Lexington, Nebraska. This good bull was sired by PIE One of A Kind and out of a daughter of Holden Vista 541. He had a weaning weight ratio of 113, and a yearling weight ratio of 116. Thomas and Cathy Stalcup from Crump Land & Livestock, Gillette, Wyoming, found their top selection in Lot 6 at $18,000. He was a son of PIE The Cowboy Kind, and out of a Magnum dam with an MPPA of 105. The top selling registered fall calving Cow was Lot 186, selling for $10,000 to C. V. Ledbetter & Sons from Okmalgee, Oklahoma. The top selling registered open heifer was Lot 225, selling for $6000 to Hansine Ranch, Pierre, South Dakota. Volume buyers were Wagonhound Land & Livestock, LLC, of Douglas, Wyoming, with 13 bulls, and Laramie Cattle Co., Rozet, Wyoming, with 12 bulls. Watch for the Pieper fall sale on October 28, 2017. Lot 33: PIE Right Time 347 X LSF Saga 1040Y, to Hangin F Red Angus, Wyoming, at $16,000. Lot 7: Brown Pursuit A7670 X LSF Saga 1040Y, to Crump Land & Livestock, Gillette, Wyoming, at $15,000. Lot 5: WCR Outfitter 4245B X LSF Saga 1040Y, to Doug Samp, at $14,500. Lot 32: WCR Outfitter 4245B X Red SSS Oly 554T, to Ronnie Robinson, Orlando, Oklahoma at $14,500. Lot 11: LSF Saga 1040Y X Haycow Cutting Edge 055, to Crump Land & Livestock, Gillette, Wyoming, at $13,500. Lot 12: PIE The Cowboy Kind 343 X TPIE Wagonmaster 753, to C. V. Ledbetter & Son, Inc., Okmalgee, Oklahoma, at $13,500. Lot 24: Smoky Y Conrad 1419B X Loosli Hobo 922, to Rock'N R Ranch, Planville, Kansas, at $13,000.